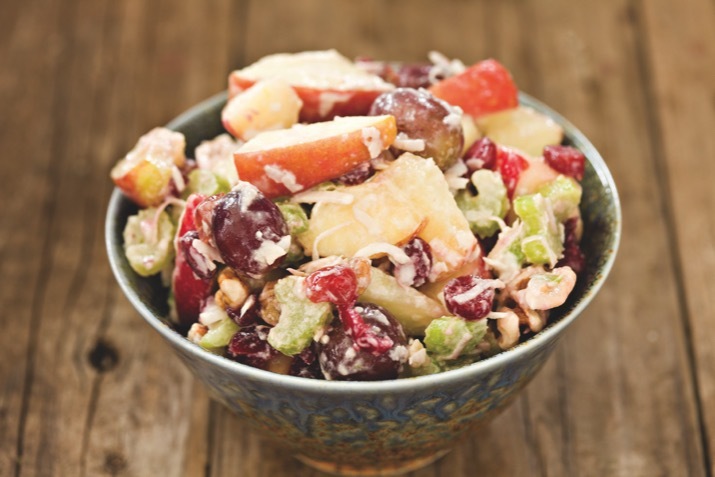 This tasty apple fruit salad is perfect for a brown bag lunch. If refrigerated, try it with Greek yogurt, too. In a large bowl, mix together all of the ingredients and serve immediately. If making the salad a day ahead, add the granola just before serving. Pack the apple salad into individual serving containers and top each with equal amounts of the granola (if the lunch box/bag will not be in the refrigerator, leave out the yogurt). Substitute orange juice for apple juice or lime juice for the lemon juice for an even perkier flavor.